As Automation Eliminates Jobs, Tech Entrepreneurs Join Basic Income Movement How will the economy provide economic opportunities if employers need fewer workers in the future? A growing number of people in Silicon Valley are saying the only realistic answer is a basic income. 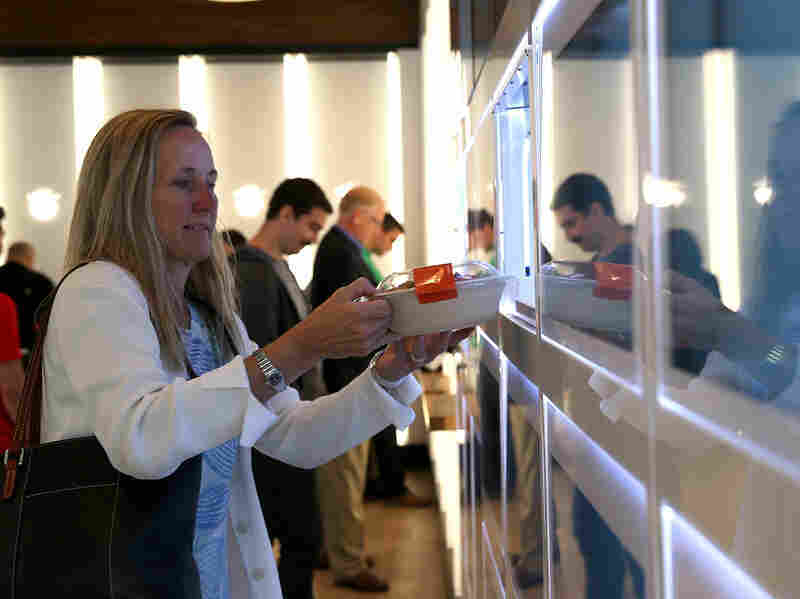 Customers use interactive kiosks to place orders at Eatsa, a fully automated fast food restaurant in San Francisco. Much of the anger and anxiety in the 2016 election is fueled by the sense that economic opportunity is slipping away for many Americans. This week, as part of NPR's collaborative project with member stations, A Nation Engaged, we're asking the question: What can be done to create economic opportunity for more Americans? When we talk about the economy, we spend a lot of time talking about jobs — how to create more of them and how to replace the ones being lost. But what if we're entering an automated future where there won't be enough jobs for the people who need them? If this happens, how will people pay for food and shelter? In Silicon Valley, a growing number of those in the tech sector believe that one solution may be the universal basic income. Simply put, the idea is that Uncle Sam will cut citizens a regular paycheck whether they work or not. Misha Chellam is a tech entrepreneur in San Francisco and is part of the burgeoning basic income movement here. He took me to Eatsa, a healthy fast-food joint, to show me why many in tech are coming to this conclusion. If Apple opened a fast-food place, it would look sort of like Eatsa. The space is bright and the decor is sparse in that trendy modern way. But when we enter the restaurant, I notice right away there are no cashiers to take our order. "That's part of the magic here," Chellam says. "We're not going to order from anybody. We're going to order from computers." Chellam and I walk up to one of the iPads mounted on the wall. The first step is to swipe your credit card, which Chellam does. "Now what are we going to eat?" Chellam asks after his credit card is accepted. Eatsa's thing is quinoa bowls, and you can see photos of its offerings on the screen. I go for the burrito quinoa bowl and Chellam orders the kale. A couple of clicks later we're done. There are about 15 to 20 customers in the restaurant, but just one Eatsa employee. "I have this gut sense from having been in the Valley for a while now that there will be a coming wave of automation that's going to get rid of a lot of jobs," Chellam says, back at his office in downtown San Francisco. A customer picks up her lunch from an automated cubby at Eatsa. The restaurant has eliminated server, wait staff and cashier jobs with computer automation. It's unclear whether technology will eventually reduce the total number of jobs in the country. While technological advances make some jobs obsolete, the past has shown that tech has also created new opportunities. But advancements in artificial intelligence are intensifying this debate. In Silicon Valley, there are lots of experiments in automation. There's the robot at Lowe's home improvement store in Sunnyvale, Calif., that checks inventory. There's the "robot butler" working at a hotel in Cupertino. And then there's Uber, which is experimenting with driverless taxis and trucks. "And that would affect 3.5 million truck drivers, another 5 million people who support the truck-driving industry," Chellam says. "And that's just one example of automation." Chellam says software is eating white-collar jobs, too, and everyone from bookkeepers to doctors and lawyers will be affected. Chellam criticizes politicians for not talking about this automated future. At best, he says, they talk about "retraining," which doesn't address the scope of the problem. "Take the truck driver example," he says. "What are you going to retrain 3.5 million people to do in a short enough period of time?" Chellam believes as technology replaces more workers, the traditional 40-hour-a-week job could become a thing of the past. If that happens, how will families get health insurance or save for retirement? Some experts say the only answer is a government-guaranteed paycheck that would allow people to buy food and housing. That would not only help the individuals but would help keep economic wheels spinning and generate tax revenues. "Silicon Valley's interest in the universal basic income is one part guilt and one part optimism," says Natalie Foster, a fellow at the Institute for the Future, a nonprofit research organization in Palo Alto. Some technologists suggest setting the basic income at $10,000 a year. Others have proposed raising carbon emission taxes to pay for it. Foster says there hasn't been enough research on basic income to have serious policy discussions. She said that right now tech workers are in the "inquiry and research phase." They're holding meetups and hosting panels asking what would it mean to give people money they didn't work for, Foster says. In Oakland, they're about to find out. Y Combinator is funding a research project on basic income, where it will pay 100 people enough money for food and shelter — no strings attached. 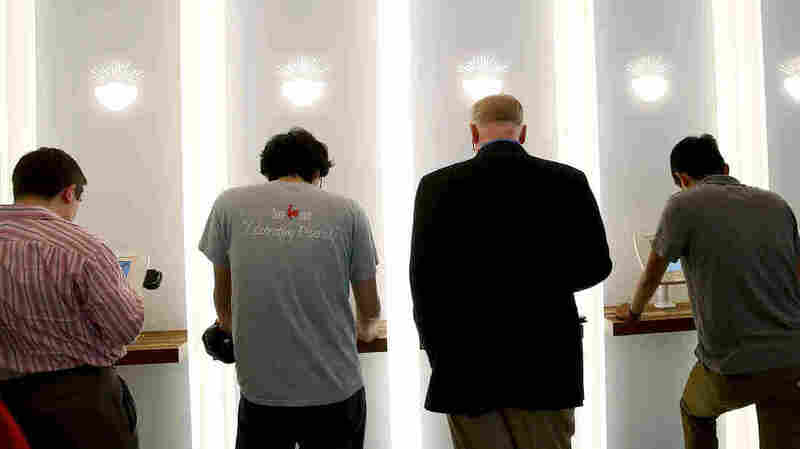 The prestigious tech accelerator helped launch companies that include Airbnb and Reddit. Y Combinator declined requests for an interview, but in a blog post its president, Sam Altman, predicted that "at some point in the future, as technology continues to eliminate traditional jobs and massive new wealth gets created," some version of basic income will be rolled out nationally. The debate about whether machines are taking our jobs is beside the point, says Chris Hughes, a co-founder of Facebook who is active in the basic income movement. He says that whether you like the idea or not, there won't be an alternative because decent-paying jobs are disappearing for millions of people. "The reality is that work has changed. Forty percent of jobs are now contingent, meaning they're part-time, independent contractors, Uber drivers," he says. And he says that shift has already left middle-class Americans economically insecure. A recent study by the Federal Reserve found that 46 percent of Americans surveyed didn't have enough cash to cover a $400 emergency expense. That feeling of insecurity is evident in this tumultuous presidential election. "I think there is a sense that our economy is broken in many ways," Hughes says. "But rather than try to restructure our economy so it looks like the 1950s, I think we have to be honest with ourselves." Hughes says that means basic income isn't an idea for the distant future but one we need to consider today.